Singapore-based gourmands will be excited to know that Pantry Magic is opening the doors of its first Singapore shop on Monday, 29 Janaury 2007. For those who haven’t visited one of their two stores in Hong Kong or its shop in Taiwan, Pantry Magic is a (relatively) new, Asian chain specializing in cooks’ tools. My darlin’ wife S and I dropped by the new store while the proprietors were unpacking their wares and setting up their displays. It was pretty exciting to see all the gorgeous product just waiting for eager beavers like me to buy and bring home. S was especially interested in the wide range of bakeware available while I was literally drooling over the gleaming copper pots and pans filling the store’s shelves. 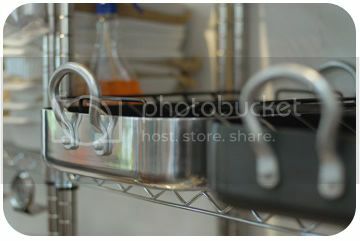 We also really liked the roasting pans that they’ll be selling. It’s hard to find nice pans with upright handles. The store has a pretty amazing range of product. The prices are pretty impressive as well. Because Pantry Magic manufactures a good deal of their own wares, they are able to price their items at 30%-40% less than similar, imported products. 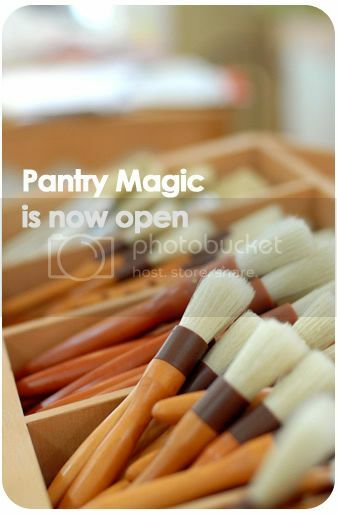 Update: Pantry Magic is now located at #44 Club Street, Tel 6224 4055. Well, I can’t wait to visit the store too after seeing it being put in place last week. Certainly makes visiting Chip Bee Gardens a regular feature from now on and just hoping that it won’t burst my pockets!! oh excellent!! I was just at chip bee garden yesterday (checking out shermay’s cooking school), cant believe i didn’t notice a new shop being set up!! Thanks for the heads-up! I’ll be going to HK in Feb…guess I can add this as a new stop in my itinerary! Their website has a non-working link to M’sia…hopefully they’re planning to open one here as well (better late than never!!). On an unrelated but very-pertinent-to-food note, would you happen to know if there’s any good “banh mi” outlet in Singapore? WOW….looking good. I love baking (see my website) therefore I got an address for materials (baking) but I’ll pay a trip to this suggested place. I was there a few days ago. And I can’t wait until they’ll be getting their approval for their ceramic dishes. I need those tiny ramekins I was seeing there during my visit. I checked out the place yesterday…the place is gorgeous! The setup is good. And it just has such an american feel to it! i am so in love with the fish kettle. Gorgeous!! Why i need a fish kettle i dont know…cos a wok does a great job in steaming fish. I def am going to invest in one of those roasting pans when i move to my new place in the east. And the pink pouring bowl with a handle…nice!! It is a cook’s paradise! Thanks guys! Glad you like the store. We got our approval to sell ceramics last week. @ beth. Thanks for your hint. I was there already for that. I walked past the place when it was still under construction. Thanks for the heads up! I’m really psyched up to visit the store!